From February 13, Honolulu will host over 30 international artists for Pow Wow 2012. The event, conceived more as gathering than exhibition, shares the creative process with the City&apos;s wider community through live painting, shows, and pop-up shops. 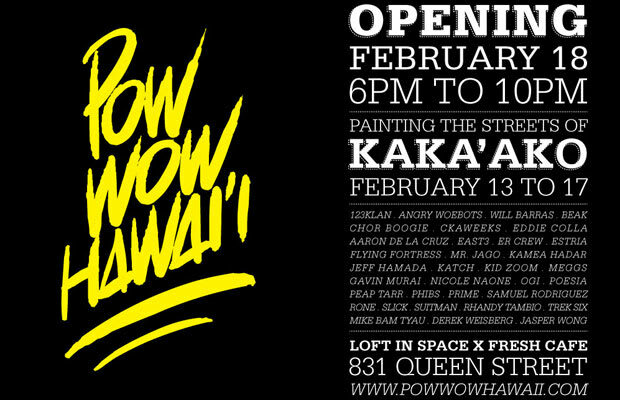 The assembled artists will paint the streets of Kaka&apos;ako through the 18th, at which time the official Pow Wow exhibition will open at Loft In Space. In addition to the central show, Eugene Kan has curated Day Job?, a photography exhibition sharing the work of creative folks who don&apos;t wield a camera for a pay check, and Arkitip will open its first ever shop on Hawaiian ground. Pow Wow artists include Eddie Colla, Flying Fortress, Jeff Hamada, Meggs, Mr. Jago, Rone, and Will Barras. Click the thumbs for fliers detailing all the events and selected work by the participating artists. Loft In Space is located at 831 Queen Street, Honolulu, HI 96813.